One of the main reasons that building an addition can cost twice as much per square foot as remodeling an existing space is the foundation. Unless you’re building up or bumping out, every addition requires some sort of masonry foundation dug down below the frost line so it won’t get pushed around by freezing temperatures. The earthmoving and concrete-pouring required to support the new construction can be 10 to 15 percent of the total project investment, says Eden Prairie, Minn., design-build contractor Mark Mackmiller. But there are some ways to slash those costs. Full Basement This is the costliest option because it requires the most digging and the most concrete, plus the crew will likely have to break through the old foundation to connect the new and old basements together. What you get, however, is basement space that can easily be converted to living space, either now or in the future, for a nominal added cost, Mackmiller says. Plus, you can insulate under the floor and can use solid wood flooring, which isn’t an option with all foundation types. Crawlspace By building your basement only a few feet deep, you might save $3,000 or more for a 12x14 foot addition, while still retaining the ability to use solid wood flooring and to fully insulate under the addition. And all you really give up is the headspace that would allow you to convert the basement to living space in the future. That’s why this is the standard approach to additions in most parts of the country. Slab Built much like a concrete patio (though with deep footings around the perimeter to support the weight of the structure), this combines the foundation and the floor in one layer of concrete. It only works when the addition is right at grade level, in which case it’s the cheapest option available, saving perhaps $5,000 compared to a crawlspace basement, according to Mackmiller. The crew can put insulation under the slab (as well as electrical, plumbing, heating and cooling lines), but because of the concrete, the floor will typically be fairly cold, says Schultz, and solid wood flooring isn’t advised due to moisture in the concrete. 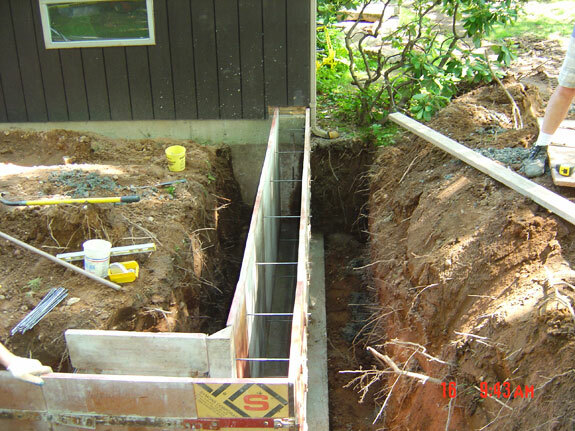 Pole Footings When the addition is above grade—either because your first floor is high above the ground or because you’re building a second floor addition with, say, a screened porch below it—the lowest cost option is to forgo a foundation or slab and use pole footings instead. This is what’s typically used for decks: Holes are dug down below the frost line, cardboard tubes are inserted in them, and then concrete gets poured into the tubes. Once it has cured, the tubes are cut away and the concrete serves as footings for posts that hold up the addition. This allows for a wood floor and for insulation, though it’s typically not as warm in the space as when there’s a foundation underneath. Again, you can save as much as $5,000 compared to a crawlspace.